Janome’s New Home 720 has all of the features you love in a sewing machine, but comes in a smaller size and at a more affordable price. Ideal for beginners and traveling sewists, the New Home 720 weighs just 12 pounds and is 3/4 the size of a regular machine. There’s a lot to love about the New Home 720 machine. We love that it’s smaller and lighter than a full-size machine, but more importantly, we love that it has all of the same features and power of a regular machine. The smaller size and lighter weight of the machine make it a great option for traveling sewists and beginners. This model is also a good option for people who attend guild meetings. The New Home 720 has plenty of stitches to work with – 20 in total. Some people think sewing machines need to have hundreds of stitches, but in reality, you’ll only use just a handful of different ones for your projects. Along with stitches, the machine also has 2 one-step buttonholes. One-step buttonholes make it easy to add buttons to your projects. The New Home 720 makes threading easy thanks to the built-in needle threader. It also has a top-loading, full rotary hook bobbin for easy loading. The auto declutch bobbin winder allows you to load up your machine and get started faster. Threading is easy, which makes it easy to get going on your projects and finish faster. With the 720, you have more control over the tension and stitches themselves. The manual thread tension control allows you to adjust the tension according to the fabric and thread you’re using. You can also control the stitch length and width. The width can be adjusted to a maximum of 4mm, while the length can be adjusted to a maximum of 5mm. There’s an easy reverse button as well as a start/stop button. The start/stop button allows you to sew without having to use the foot pedal, and the reverse button makes it easy to lock stitches at the begging and end of the seam. On top of all this, you can also control the sewing speed. The machine has a speed control slider that makes it easy to sew faster or slower. Slower sewing speeds are ideal for delicate fabrics or when working with multiple layers. The New Home 720 sewing machine has an extra-high presser foot lift, which makes it easy to work with thick fabrics and multiple layers. The machine has a backlit LED screen with navigation keys, so you can easily choose your stitches, and make width and length adjustments. The 4-piece feed dog also takes the challenge out of working with difficult fabrics. The free arm design of the machine allows you to work with arm holes and pant legs. It’s also great for quilting, especially if you’re working with larger projects. The New Home 720 comes with standard accessories that make it easy to get started with any sewing project. Janome also includes a hard cover with the New Home 720. The hard cover is a welcomed perk, as most machines only come with a soft cover or none at all. If you like to sew while you travel, the hard case will make it easier to transport your machine without worrying that you’ll damage it. The only complaint with the New Home 720 is that it’s not ideal for machine quilting. Part of the problem is the machine’s weight. Because it’s so lightweight, free motion machine quilting is a challenge. The size is also a bit small for quilting. That being said, you can lower the feed dogs if you wanted to give it a try. 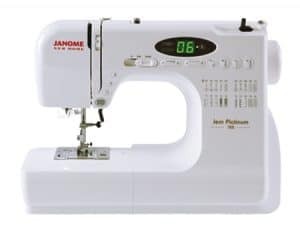 The Janome New Home 720 sewing machine is a great option if you’re looking for a machine that’s lightweight and travel-friendly. It comes with all of the features you could want in a full-size machine, but with the convenience of a compact design. It may not be ideal for quilting, but it’s a great option for nearly every other sewing project you can imagine. If you’re part of a sewing guild, this machine is one of the best options out there. Click here to learn more about the Janome New Home 720 sewing machine.